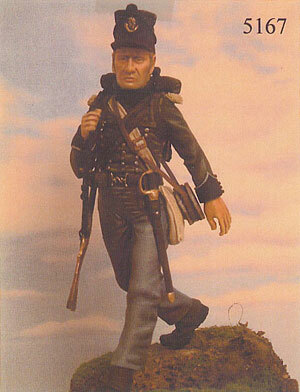 This figure, depicting a Rifleman on the march, will be familiar in the imagination of anyone who has enjoyed the famous Sharpe books. His equipment and this representation of the Baker rifle are authentic and his face carries the somewhat aloof expression to be expected of a member of the professional elite. This soldier is evocative of the many battles in the Peninsular fought by Wellington against various Marshals of France and ultimately led to the downfall of Napolean.